Posted September 28th, 2013 . Oh geez!!! Lol . Cute!!!!!! We have a mini dachshund who tried soooooo hard to drink from the toilet! But, alas, he’s too short! I have a mini dachshund that jumped into the toilet! I had a dog that would ONLY drink from the toilet! She would drink so much then stand there & bark- she wanted a flush! She was a crazy dog! Well, of course! All dogs know that…and quite a few cats, too, actually. And hopefully it’s *always* fresh!! My weim opens the lid enough to get her head in!! This is why I keep them around – smiles all/most of the time! We tried putting the lid down. Our husky mix learned how to flip it up with his nose. Interesting to walk in the bathroom and not see his head because the lid Is covering it while he got his drink! SO what’s wrong with toilet water, anyway! 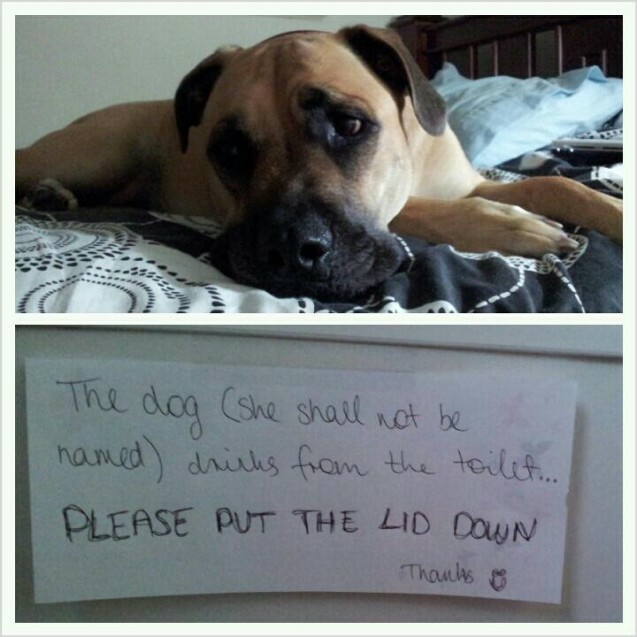 We have a sign like this up at our place, but we’ve added that the guilty party that leaves the lid up gets to brush our dog’s teeth.